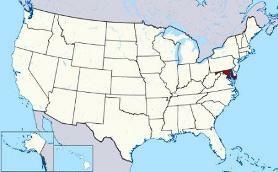 Where is the Capital of Maryland? 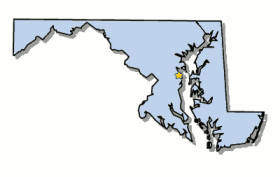 The Map of Maryland (MD) shows the location of the state capital in the "Old Line State". Maryland has 23 counties, and the capital of the State is Annapolis. On a map, the capital city is always indicated by a star. Interesting fun facts about Annapolis including its history, location, county, current population, size of the city and the nickname of Annapolis, Maryland. The Map of Maryland map provides an outline of the state, which covers 12,407 square miles. The size of the state's capital city, Annapolis, is 8.1 square miles. Test your recognition skills of the map of the state, and knowledge of its capital, with our State Maps Quiz Game. The location of Annapolis is approximately 32 miles from Washington and 26 miles from Baltimore’s Inner Harbor. The city is located in Anne Arundel County, Maryland. Each of the 50 states have their own capital city. The city of Annapolis is the capital of the state. The capital does not have to be the largest city in the state, but is usually centrally located either geographically or by population. Fact 3: The population of the capital city of Maryland is 38,620. Nickname "Crabtown"
Fact 6: History - George Washington first visited Annapolis in 1751. The Declaration of Independence was signed by four residents of Annapolis - William Paca, Samuel Chase, Charles Carroll and Thomas Stone. Fact 7: History - The city became the state capitol in 1772 and is the oldest state capitol in the USA that is still in continuous legislative use. Fact 8: History - The Continental Congress met in Annapolis, Maryland from November 26, 1783 to June 3, 1784. Fact 10: History - The author Alex Haley wrote "Roots" detailing the lives of his ancestors, starting with Kunta Kinte. Kunta Kinte landed in the city from an African slave ship and a statue of Alex Haley now marks the site. The number of people, or the population of the capital city of Annapolis, obviously changes constantly but the government statistics for the 2012 population of Annapolis was 38,620, which provides a good indication of the number of inhabitants of the city. We hope that the interesting facts and information about Annapolis will help kids and school children with their homework. Learn more by playing the States and Capitals Game.